Bean Around Town: My cheapness makes me healthier? I have been experimenting with couponing the last few months and I am starting to devise a system that seems to be working out. 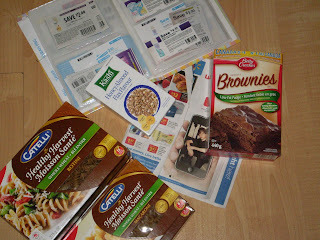 I use a mini photo album so I can flip through and see all the expiry dates and details. Mine is a flat one and small enough to carry in the basket of the shopping cart for quick referral. I also have an envelope in the front for coupons I plan to use on that particular shopping trip. Now, there are many experts out there on the subject, my post is but a fledgling (word of the day) attempt to emulate those people, so if you are going to follow my ways, do so at your own peril. I may or may not be getting it right. There. Disclaimer complete. Pictured here are a couple of things I got for fifty cents each using coupons and the Kashi sample, which was free and came with a two dollar coupon. I shop according to the stores' loss leaders and then use my coupons. If the item is not on sale, a coupon doesn't make much difference to the bottom line. I throw out a lot of coupons that expire and/or are not worth the deal. Each month, I go through and make sure none of my coupons are expired. Here, when the item is 1.49 on sale (Canadian prices) my dollar off coupons give me a little more bang for my buck. Many people say that coupons make you buy items that you wouldn't normally buy, and then hook you on that brand. I say, that is mostly true, with some caveats. For instance, it is true that I don't normally buy Catelli brand multi grain pasta. I usually buy generic white pasta. For fifty cents, though, I will stock up on multi grain pasta. Maybe I will become hooked on it and then eat only multi grain pasta from now on! Wouldn't that be wonderful? The brownies, I wouldn't normally buy, as I usually make those from scratch using my own homemade mix. For convenience and the price, I thought, why not? When I got home I realized they were "light" brownies. Good thing, because now I can eat twice as many without guilt ;) I admit that I have made a few errors and bought things that were not worth the price, even with a coupon. I am on a learning curve and frugality is a process, not an event. It is my hope that what good deals I do make, make up for the blunders and it all evens out. At some point I will come out ahead, right?? Also, on the suggestion and review by The Non Consumer Advocate I reserved, at the library of course, a copy of The Complete Tightwad Gazette. What a treasure trove! I am actively searching at Swagbucks to get enough giftcards to order this beauty for free! OK, back to real life, my kitchen is a disaster. Have a wonderfully frugal day.